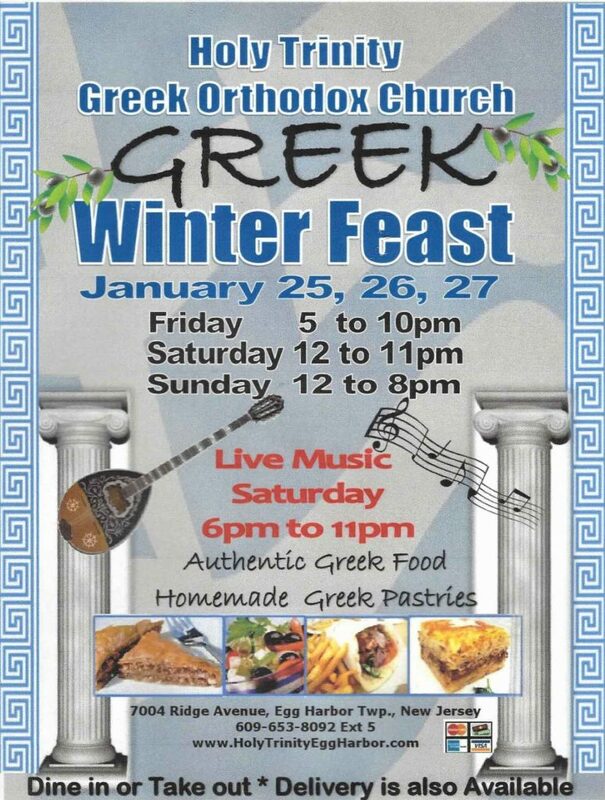 Support Holy Trinity’s 11th annual Greek Winter Feast, where everyone is welcome to come and feast on the delicious foods, and pastries of Greece, lovingly prepared by our parishioners. Added by popular demand in recent years, are the Vegetarian Gyro Sandwich and the Gyro Platter with French fries. Try the tasty moussaka, pastitsio, spinach and cheese pies and roast lamb dishes also offered. Clap your hands as our Holy Trinity Dance Group, the Olympian Performing Artists, (OPA) entertain in traditional costumes, on Saturday and Sunday at 6.30pm. Greeks without dancing? Never! Join in the Greek dances, at the Taverna, with live Greek band music, on Saturday evening, from 6.30 pm to 11pm. Shop at our Greek Marketplace, with teas, coffee, honey, olive oil, and olives, among the many Greek products offered for sale. The Children’s Craft Corner where our young guests make Greek flags, Olympic flame torches, laurel wreaths, and other crafts, is a fun way to take home a souvenir of Greece. Buy a raffle ticket to win a basket of gift cards, valued at $300, and good luck at the drawing, which will take place on Sunday at 8pm. Understand the beauty of the ancient Orthodox faith, during the Church tours, held from 6pm – 8pm, Friday and Sunday and Saturday at 3pm-5pm. Holy Trinity Church with Father George and all our parishioners, look forward to offering you our hospitality. We deeply appreciate our volunteers, donors, sponsors, and all our wonderful visitors who make our Greek Winter Feast always a success! Dine in, Takeout and Delivery is Available.